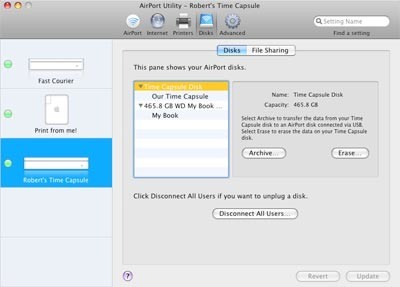 You can plug any USB hard drive into a Time Capsule and expand the available disk space of the Time Capsule that way. This is then accessible as usual as a Network Attached Storage device for your Mac backups or whatever, and you can then even directly backup wirelessly to that external drive connected to the Time capsule using Time Machine. Apparently this feature has existed since the dawn of Time Capsule, but I just inadvertently discovered this. This is great because it allows you to expand your Time Capsule storage yourself if you run out of space, but also because you can buy the cheaper model and then just attach a huge external drive to create a massive capacity NAS device. You may have seen that Apple announced two new versions of the Time Capsule, they come in 2TB for $299 and 3TB for $499. Spending another $200 just to get another 1TB of storage seems a bit expensive, and that’s exactly where I found the tip on 9to5mac. In a post where they say the new 3TB Time Capsule price tag is “crazypants” they suggest you buy the 2TB model and then use your own 3TB drive for a total of 5TB of storage. This is great idea, and suddenly the Time Capsule became a lot more appealing to me, because this means less money for more storage. If you feel like doing this, both the Seagate 3TB USB external hard drive and Western Digital 3TB USB external drive are $149 with free shipping from Amazon. Stack that on your brand spanking new Time Capsule 2TB, and you’ve got yourself some serious wireless storage capacity. Welcome to 2008 Mr Chan, did you send in your ballot yet? I’ve upgraded my Time Capsule 1TB internal hard disk with a new WD Caviar Green 2TB. Was a very easy task. The Time Capsule now is silent, I can barely hear it when it spins the drive. Plus is much cooler since those hd are very good on energy saving and they don’t produce too much heat. Moreover I’m still using the old internal drive with an external box (old backups are stored there). In my opinion there are a few things that Apple should make better in Time Capsule internal OS (netBSD): support for the “new” hard disk 4k sector formatting (which is already supported in Mac OS X), and the possibility to copy files between the internal disk and the disk physically attached to it via USB through Utility Airport (ie simple filesystem copy). Nowadays we can only archive what is in the internal drive to a media attached via USB, otherwise we have to go trough AppleShare. It’s slow, and sometimes can fail. 1) Are those HDs you link to at Amazon server grade? The Time Capsule uses server grade drives, as they run, well if not constantly, then certainly quit a lot. 2) Can you attach multiple USB drives via an USB hub? I think you can. At least they say: “And if you want to share both a printer and an additional hard drive, you can. Just connect a USB hub to Time Capsule. Whatever the combination, Time Capsule divides and conquers.”. Whatever combination to me means a printer and a drive or two drives. Is Hitachi DeskStar a server grade hard disk? Cause that’s what I’ve found inside my TC! You can do this with the AirPort Extreme too and save a bunch of money since you don’t pay for the storage side of things through Apple. These say, “Time Machine can’t back up to an external disk connected to an AirPort Extreme.” Obviously, it can be set it up that way, but I wouldn’t trust my backup to something that Apple specifically says not to do. In addition to the server-grade drive quality (as also used in DirecTV DVR internal HD’s) needed for getting by Apple’s pricing “on the cheap”, I’ve seen no mention of the USB port’s throughput rate as being a much slower ‘choke point’ vs. the internal drive’s likely e-Sata interface’s rate. This will likely make a much slower interface for any drive’s other speed factors (spin-rate, etc.). In a side-by- side comparison, this s/b especially noticeable under heavy data loads. … just my 2 cents. I’ve never regretted sticking with high quality components. I DO add non-Apple high quality RAM & HD’s all of the time. Is the USB 2 connection the real bottleneck? Think about what’s the highest transfer speed you can achieve over an ethernet connection… And maybe in most cases people would access the TC via Airport which is even slower. It would be the same for every NAS unless we have the possibility to access the filesystem of them in some way. For TC —since Apple has chosen to jail the netBSD OS running on them— they should add this feature to Utility Airport. Otherwise they should let advanced users to connect via ssh terminal/finder sessions (using a user without administrative privileges) to deal with simple file copying between TC internal disk and USB disks attached to it. I tried this with an Extreme and an external drive and every once in a while the network connection would flake then the backup on the drive would corrupt. It was painful enough that I eventually went back to individual hard drives on each Mac. That’s probably cause the external USB disk you’d used didn’t have enough cache (32MB and up should work fine), if for the external USB disk works the same as for the internal TC disk. I think your article is somewhat misleading. Yes, you will have a total of 5 TB of storage, BUT, Time machine will see two separate drives ( 2TB and 3TB ). It would be like you had to separate NAS devices in your home. Time machine can only use one of the drives, either the 2TB or the 3TB. You will NOT have 5TB used for Time Machine backups. if I move my iTunes library to that attached external drive, would my apple TV see it? I have a 2tb external drive attached to the usb port of a 2tb time capsule. The itunes film library is on the external drive, and since itunes does all the controlling, the apple tv 2 sees the films fine, sometimes a bit slow when the time capsule has to wake up the external drive but works fine. Does anyone know if you do hook up an external drive to the TC will the mac back up to the External Drive if you choose it to or will it automatically Back up to the TC? I noticed Gordan made a comment regarding the misleading of the article, so if you guys don’t mind can we get clarity on this issue? Do you get to Choose either the TC or the External HD to Back up to ?? Ok i was having problems backing up using Time machine because i have a 2008 TC 500 GB. I upgraded to a 1 TB HD on my Macbook Pro 15″ and now with all the Lion and Logic stuff my back ups were exceeding 500 GB so it would not back up for almost a Year now. I found this article and was reading about adding an External HD to the TC. When I added my old 250GB HD that i removed from my Macbook Pro when I upgraded i put it in an enclosure and hooked it up to the TC and all of the Sudden my TC is now backing up. Not to discount GORDAN for his post because i was very unsure if this would work. I am now backing up and will repost a message if it continues to back up when its done. because if it now continues to back up that means that it does expand the HD in the TC and allows you to use both the External & Internal HD’s For Time Machine Back Up’s. Funny that it would not back up because the HD in the TC was not large enough and now that i added the 250GB External HD to the TC it is now BACKING up after a year of Not backing up. We shall see. Will repost an answer shortly it remains at 20 hours still. Any Help offered would be greatly appreciated as I am new to learning yet some things with Apple. Hi Daniel, just read your post, did the backups to TC continue to work OK with this setup ? does anybody know anything about MACKEEPER? i keep seeing advertisements and a lot of Controversy over this software taking over your mac and causing a lot of problems. I pity the poor souls who only have 1 TB for backup! The first hard drive I ever used was attached to an IBM 1620 Model II computer. The year was 1969, and the hard drive could hold 1 million decimal digits, or about 500 KBytes. A 2TB drive would hold all the information from 4.3 million of those. Incidentally, the drive I am talking about was about 20″ x 20″ x 3′ tall, holding a removable disk of about 6 platters. You could watch the platters spinning through the plastic cover. The greatest maintenance problem of this device was that it sometimes leaked hydraulic fluid, making a puddle on the floor. lol. no wonder you changed to Mac. If I add an external drive that was not MAC formated, the files are all read only, and I am not sure how to get at them. If I remove the remote and reattach it to the time capsule, will they become read/write? Is there a wa to default the download to a read/write? Have you tried reformatting the drive using Disk Utility? Try the Mac OS Extended (Journaled) format, Mac OS Extended (Case-sensitive, Journaled) or Mac OS Extended (Case-sensitive, Journaled, Encrypted) format.